Our second shortlist in the 2017 Coffee Spot Awards is the “Best Takeaway Coffee” Award, which was won last year by Hatch Coffee. It recognises those places which, braving the elements, still produce an excellent cup of coffee. This includes coffee carts, coffee stalls, those Coffee Spots which are so small that they only serve takeaway coffee and those Coffee Spots where I regularly get my takeaway coffee (even if they offer a regular sit-in option). 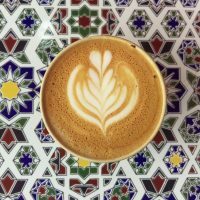 There are 13 Coffee Spots on the shortlist this year, all listed in order of publication. 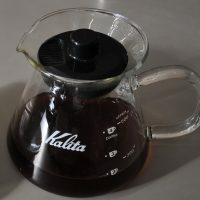 Could our first entry be the future of coffee? Cafe X in San Francisco, is an entirely automated coffee shop, where you order by app on your phone or at one of the tablets at the kiosk. 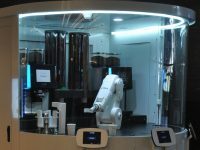 Your coffee is then made by a robot barista. The only downside: you can’t use your own cup. Cafe X has also been shortlist for the Best Saturday Supplement Award. The Allpress Dalston coffee shop, part of the excellent roastery, serves great espresso-based drinks as well as great pour-over and wonderful breakfasts. 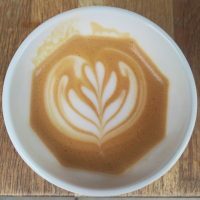 However, it’s on this shortlist for the takeaway coffee I had at the start of the year, a lovely decaf flat white which I enjoyed in my Ecoffee Cup. Allpress has also been shortlisted for the Best Outside Seating and Most Popular Coffee Spot Awards. Strutton Ground Market, near Victoria Station, is home to Flat Cap Victoria, a veteran of London’s speciality coffee scene. For the last eight years, it has been turning out top quality espresso-based drinks in all weathers from a lovely barrow, its only protection from the elements, a black, open-sided gazebo. Flat Cap uses Notes Coffee with a single-origin espresso which changes every few weeks. It’s also shortlisted for the Happiest Staff Award. Another veteran of London’s speciality coffee scene, Flat Cap Borough is down at Borough Market and shares a common ancestry with Flat Cap Victoria. However, the two are independent operations, although like the other Flat Cap, this one also uses Notes Coffee with an ever-changing single-origin espresso. 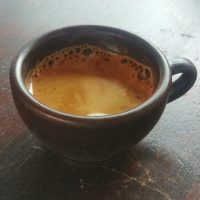 Located on the ground floor of the Fujii Daimaru department store in Kyoto, % Arabica serves a house-blend and a single-origin on espresso from a very limited menu, all roasted in-house. It’s a surprisingly pleasant environment in which to sit down and rest your weary legs between sight-seeing stops. You can also buy beans and merchandising. % Arabica has also been shortlisted for this year’s Smallest Coffee Spot Award. 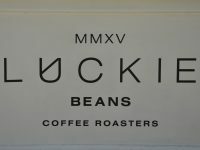 Berwick-based roaster, Luckie Beans, now has a coffee cart on Glasgow‘s Queen Street station, serving a blend and single-origin on espresso. There are also various sweet treats and savoury offerings. Luckie Beans was also shortlisted for this year’s Best Coffee Spot Near a Railway Station and Best Espresso Awards. Flying under the radar, Lever & Bloom has been serving coffee from a red miniature four-wheeled box van on the corner of Byng Place in Bloomsbury, London for several years now. With the magnificent Church of Christ the King as its backdrop, Lever & Bloom serves Climpson and Sons’ Baron espresso blend. Lever & Bloom was also shortlisted for this year’s Best Coffee Spot Near a Railway Station and Most Passionate About Coffee Awards. Successor to the Bean About Town coffee van on London’s South Bank, the lovely, old Citroen van is run by the equally lovely, but not so old, Claire. Good People uses The Grand Howl, a small coffee shop/roaster in Hackney. Bean About Town made multiple appearances on this shortlist over the years, and standards haven’t slipped. Good People was also shortlisted for this year’s Best Coffee Spot Near a Railway Station and Happiest Staff Awards. 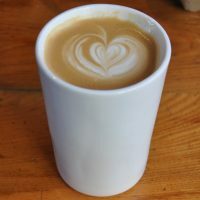 Idle Hands has had a chequered history, which is unfortunate, since Dave and Lucy make some of the best coffee I’ve had. The latest incarnation was a pop-up at Manchester-based Grub at Mayfield Road, although both Grub and Idle Hands have moved on since then. I caught Dave over the summer for an Aeropress of a rich, juicy Ethiopian Rocko Mountain from Norwich’s Strangers Coffee. 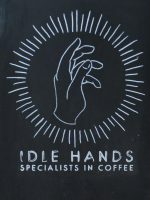 Idle Hands also made 2017’s Best Filter Coffee & Best Coffee Spot Near a Railway Station shortlists. Down in Canterbury, by the bus station, stands the statue of a sheep, and, opposite it, the Lost Sheep Coffee pod turns out excellent coffee come rain or shine. 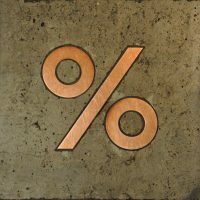 With a house-blend roasted in-house in the newly-opened roastery, and a rotating guest on the second grinder, the quality is second to none, while the friendly staff make a visit worthwhile just to say hello. 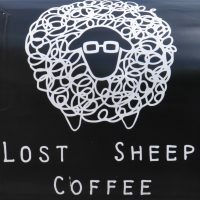 Lost Sheep is shortlisted for the Most Unlikely Place to Find a Coffee Spot and Special Awards. Like my waistline whenever I visit Crosstown Doughnuts, the London chain keeps on expanding. Serving two options from Caravan on espresso, the coffee’s just as good as the doughnuts. Crosstown is on the Best Cake, Best Coffee Spot Near a Railway Station & Smallest Coffee Spot shortlists. Manchester’s Ezra & Gil is a large spot, serving excellent coffee and all-day breakfasts. In contrast, the latest addition to the family (of two), Ezra To Go, is a smaller affair, half coffee shop, half life-style store. Serving espresso-based drinks with a house-blend from the local ManCoCo, the coffee is just as good while the food offering is also impressive, particularly given the size. 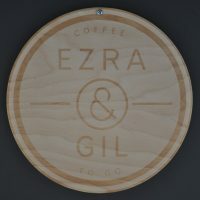 Ezra To Go is also shortlisted for the Coffee Spot Special Award. Craft Coffee is another stalwart of the London scene, albeit in a relatively new setting (for Craft) behind King’s Cross Station, where it carries on in the footsteps of names such as Weanie Beans and Noble Espresso. 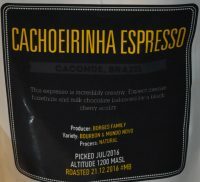 It’s also another London coffee stall serving single-origin espresso from Notes Coffee, with the coffee in question changing on a regular basis. Craft was also shortlisted for the Best Coffee Spot Near a Railway Station Award.